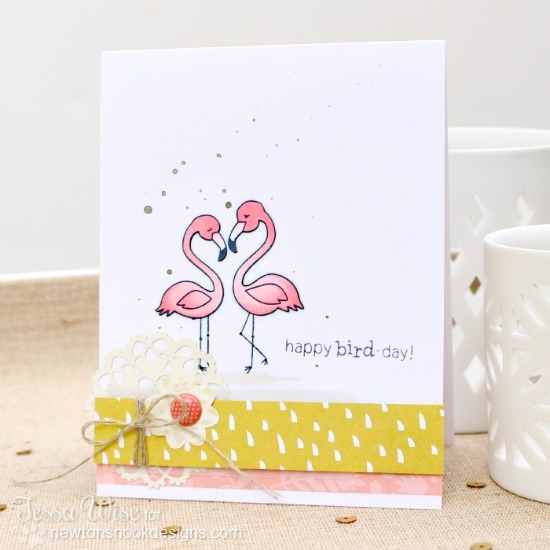 Newton's Nook Designs: NND July Release - Day 3 - Flirty Flamingos! 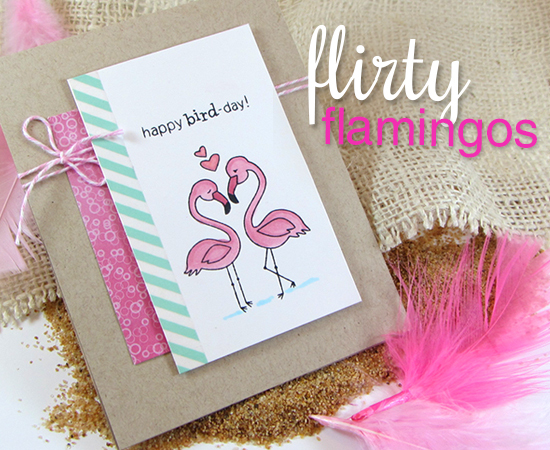 Today our first release day for July and we are featuring the set Flirty Flamingos! We are also celebrating their ONE YEAR ANNIVERSARY! ALL WEEK LONG you can enter to WIN a $20 store credit! Everyone who enters will be put in a drawing for the chance to win! PLUS --- Spread the word & help us celebrate -- If we reach 800 Facebook likes we'll pick 2 winners, If we reach 1,000 we'll pick 3 winners! Enter on our Facebook page here. Ready to be tickled pink? Check out all the amazing projects below from our Design Team below! Then, make sure to click through to all their blogs for details on their cards - Some of the designers have extra cards on the blogs and you might even find a fun video or two along the way! Make sure to comment for a chance to win! Details on the giveaway are at the bottom of today's post. 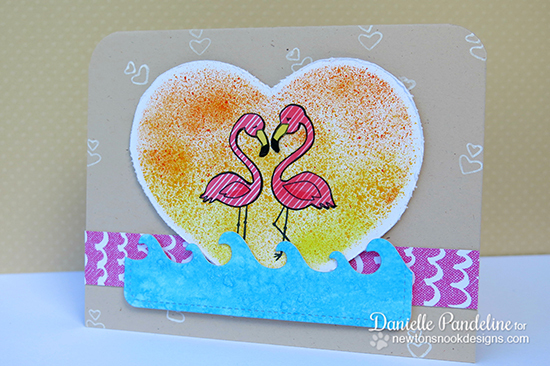 These fun striped flamingos by Danielle are so fun- and I love that speckled sunset heart behind them! Samantha created this fun little scene! Love that background - looks like graffiti! This layout by Jess is super fun - I love the speech bubble and the fun sandy beach texture! 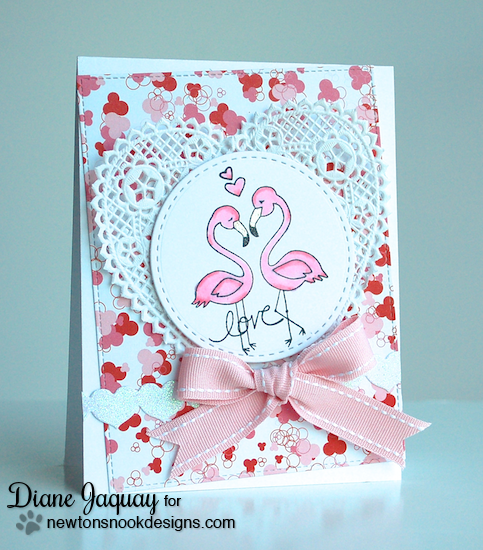 This card by Diane would make a great Valentine or anniversary card! - love the addition of the heart doily! This beautiful clean and simple card is by Tessa. I love all the little details in the corner with the twine and embellishments! 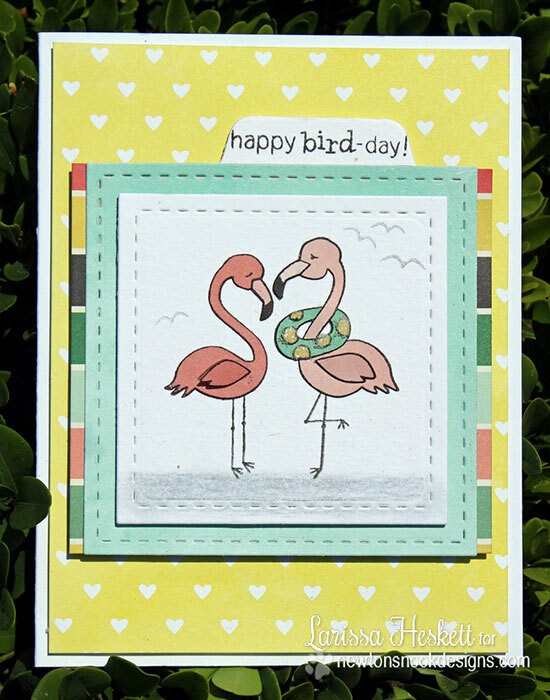 This card by Shellye definitely left me tickled pink - love the polka dots and the cute heart in the center of the two birds! Crafty Math-Chick used washi tape to create a fun pattern mix! Such a cute idea! 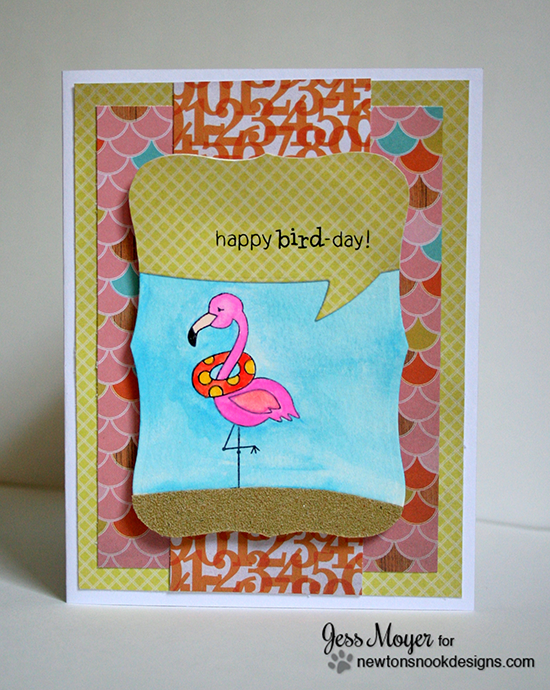 Love this flamingo card by Lydia! Such pretty coloring and the little bits of bling are so fun! Stephanie super cute card! I just love the fun mix of patterns with the palm trees and flamingos too! Such a perfect match to this set! 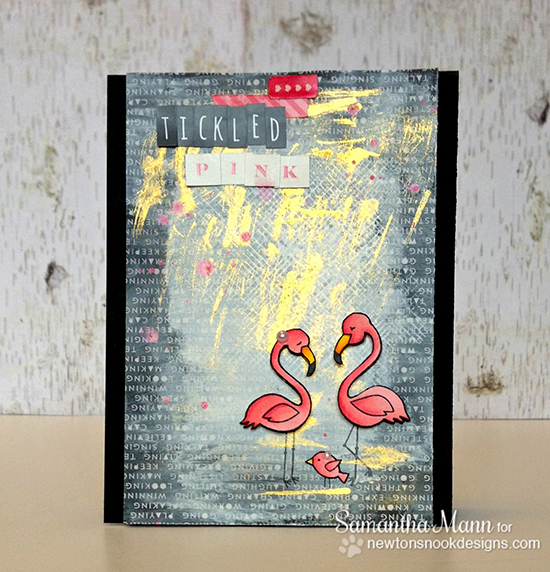 Taheerah created this fun card - LOVE the gold and pink and all the fun layering! Larissa created this cute little scene tropical scene - love the fun, bright colors! Would you like to win “Flirty Flamingos”? Comment on the NND blog and Design Team and Guest blogs (see list below)! Two winners will be chosen at random from the collective blogs release posts. Make sure to check out each of their blogs and comment for your chance to win. You will not know which blog has been chosen so the more you comment on the better your chances are of winning! You have until Thursday July 17th at 9pm CDT to comment -- winners will be announced on the blog post on Friday, July 18th. We are also be having a giveaway on Facebook - so make sure to like our Facebook page and enter to win there! Way cute stamps! The DT cards are so inspiring! 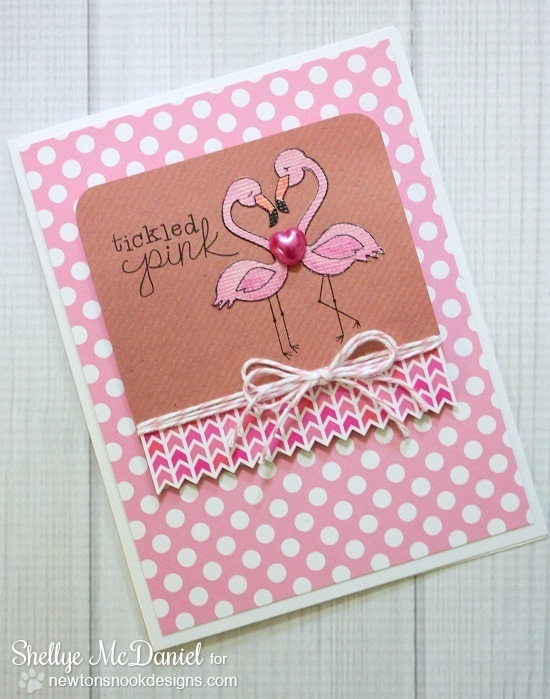 Cute projects using the new Flirty Flamingos stamp set. 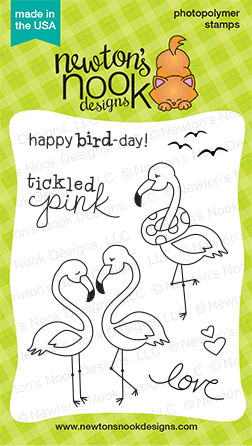 Adorable flamingos...love the cute sentiments. Very cute! I love the flamingos!! LOVE this set! My sister is nuts about flamingos, this would be perfect for her!! What a cute and fun flamingo set! Those flamingos are sooo cute! Thanks for sharing these CUTE flamingos. 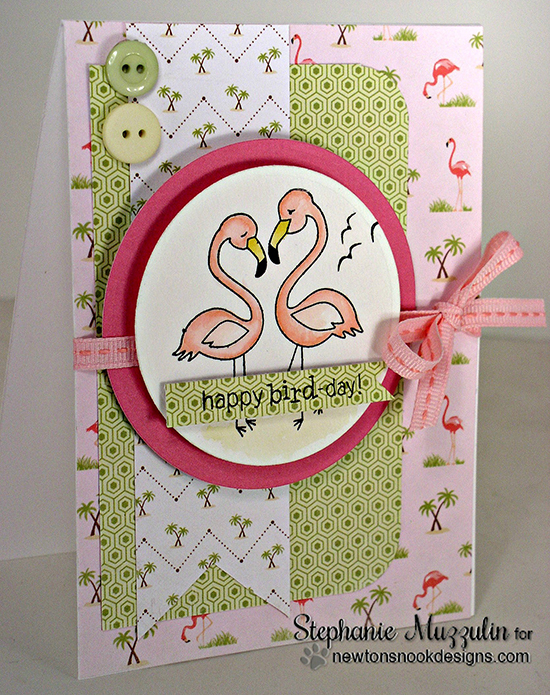 Fun, fabulous, flirty flamingos - and what a fresh set of showcases from the DT! Awesome!! Been a great release this week. Looking forward to tomorrow. Super cute set and samples. How impressive is all this - Love the set, in fact I am tickled pink about it!!! :) And your talented DT has excelled yet another day in showcasing Newton's Nook stamps!! This is so cute! I love these flamingos. Your DT samples are amazing too, so bright and cheerful. Great job! What a sweet set! And everyone's different flamingo coloring is wonderful! What an adorable stamp set! I love all the cards! Your design team did an amazing job! And they have convinced me that I need this stamp set because it is so stinkin' cute!! Ok, I have to have this set! I was excited just seeing one flamingo in the sneak peek. I can't wait to buy this one! Adorable stamp set! I love the flamingo with the tube around his neck! All the DT's samples are lovely! Thank you for the inspiration. Great Stamp. Your DT did a good job designing with it. I really like this mini set! The flamingos are super cute. I love this set, I love how its perfect for anniversaries in the summer months. Super cute set! I can see birdy Valentine's in my future. The DT did a marvelous job with this one!